November 2015 - Meet My Busy Mind. There is this government-owned Junior Secondary School (JSS) close to where I live. I have witnessed a rather perturbing sight in front of the school, driving to Court from home in the mornings. (I do not go to Court everyday. Probably about an average of twice a week. But the times I do, I have consistently observed this for the past six months). I had been bewildered to notice that at about 8.30-8.45 am on every day that I drive past the school, students dressed in school uniforms are cutting grass. I often wondered: did these children come to school to be educated and be given a foundation for their future careers … or did they come to take exercises in unpaid manual labour? I appeased my conscience with memories of being late to parade in Secondary School (I attended a military boarding school), and being given similar punishments. However, that was a different time, and I still am of the view that some of those punishments bordered on Child Abuse. But that is not exactly the point of today’s narration. So the last time I passed by this school, it was about 8 o’clock, or some few minutes past the hour. (I had to be in Court extra early that day). I noticed really nice cars dropping off various students. And right after the kids get dropped off, they just walked straight to some man sitting in front, handed over their bags, and marched right to the grass cutting area. They picked up cutlasses, and began cutting grass. Like a ritual they were well used to, and had learnt by heart. I wondered why affluent people who could afford these nice cars could not afford to send their children to private schools, as is the Nigerian norm. Yes, these kids were from affluent homes. No, these kids were not children of the affluent people. These kids were their Cooks; Maids; Washer boys; Cleaners. These kids were their helps. These kids would most likely have gotten up way before 5 a.m. Washed clothes. Cooked meals. Cleaned the house. Gotten the children of the affluent people ready for school, barely having time to juggle all the house chores and get themselves ready for school on time. Followed the affluent people to drop off their affluent children, at their affluent schools, before being dropped off at their own schools a little after the opening bell is rung. Their rewards: the cutlass and the grasses. While some would argue that these helps have it better than uneducated children in the village, I was disturbed that they already had a practical taste of modern day slavery. What disturbed/disturbs me more however is that the perpetrators of this slavery are not some abstract figure we cannot identify. They are not some ‘gringo’ from across the Atlantic, who prides himself in being a slave-master. They are among us. The Accountants. Doctors. Lawyers. Politicians. Nurses. Lecturers. Architects. And all the other 'affluent people' of our society. They ARE us. We ARE the ‘affluent people’. We are the ones who would use these 'house-helps' as slaves at home, and still perpetuate their suffering outside the confines of our homes. We are the ones who send the ‘slaves’ to school to suffer the dividends of the slavery. We all have a duty to protect every child in our home, whether ours or not. Whether the law mandates it or not. We should not suffer them, or add to their suffering. If they are good enough to be in our homes, then they should be good enough to attend the same schools as our children do. (Yes! I let out the elephant in the room). But the least we can do is let them be at school on time. We can heave and haw all we want about how 'the government' should do more to protect and better the lot of children in Nigeria. We can blame the teachers for not doing the right thing in holding the guardians responsible for the actions of their wards. But as I passed by the secondary school this morning, and saw the affluent people dropping of their wards, who marched straight to their nemesis (how come the grass never finishes anyway?? ), I am convinced that it behoves on you and I to look inwards and stop treating the ones who help us at home as slaves. That is the first step to making the world a truly better place. If you do not know by now that within the past 48 hours, France was a victim of extremist terrorist attacks …then that rock you’ve been hiding under must be pretty solid. Chances are you’ve heard of the attacks. Death everywhere is a horrible thing. This is why various nations have poured out comforting messages to France. (Facebook has even installed a new feature, enabling users to ‘hoist’ France’s flag on their profile picture). 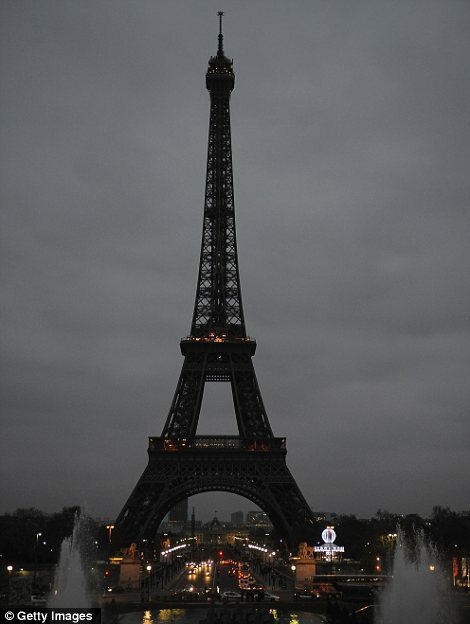 People from all over the world expressed condolences to and their solidarity with France. All over the world includes Nigeria. Nigerians poured in their grief as well, some utilizing the new Facebook feature to temporarily super-impose the French Flag on their profile pictures. The discussion dominating the world scene is what this attack means for Syrian refugees waiting to be taken in by Western Countries. In Nigeria however, uproar has (surprisingly) ensued on the internetsphere as to why prayers and solidarity should be showered on France for the 'just' 129 lives lost, when thousands of lives have been lost in Nigeria as a result of terrorist attacks by Boko Haram, without similar reaction. Some aggrieved have blamed this trend it on Western Imperialism. Citing how everything regarding the West is always celebrated, while all things African are relegated. Maybe that's a possibility. I mean, considering that the bulk of our entertainment and life commodities are imported from the West, maybe this is the West's 'way' of ensuring that their matters remain the most significant in the world. Even in terrorism-laced affairs. Others have blamed this on the lack of patriotism on the part of Nigerians who have been hoisting ‘pray for Paris’ and similar messages as being quick to mourn with others, while having their own fair share of dead. Words of wisdom such as “Charity begins at home” and “Pray for Nigeria/North-East first before praying for Paris” have suddenly sprung up everywhere. That also is a possibility; the lack of patriotism in Nigeria. I mean, almost every Nigerian has a favourite English or La liga Club. Nigerians even host parties when their favourite foreign club wins. Which is why Multi-choice - another foreigner - rips us off, through the Super-Sports Channel. Yet, the bulk of the same ‘patriotic’ Nigerians have no idea that that for the seventh time, their own local club Enyimba Footbal Club just clinched the local league title. So yes. It is a 'possibility' the grief being expressed by Nigerians over Paris is due to lack of patriotism by the commiserating Nigerians. Or maybe Nigeria vis-à-vis Boko Haram is no longer getting commensurate sympathy and coverage because everyone is tired. The World is tired. Nigerians are tired. (I am tired). Boko Haram began as something minuscule. But due to political gains, cultural and religious affiliations and sheer irresponsibility on the part of the government, it was allowed to fester and grow into the gangrene it is now. 'Patriotic' people who could have trooped out enmasse to condemn and rat out members of the sect kept mum. I remember when the Chibok debacle happened. For the whole of three weeks, the Nigerian government was silent. The Nigerian media on the other hand was confused as to whether or not to give exposure to the ongoing nightmare. Only Channels Television dared to, albeit fleetingly. The same Western world being accused of discrimination stepped in. Aisha Sesay and Nimar Elbagir (amidst others) moved into Nigeria, to create exposure, with Nima taking residence in Maiduguri (Note that local News journalists never attempted this). Protests sprang up in countries all over the world, creating further awareness. Notable among these countries was France. In the meantime, the Nigerian government officials mumbled their way incoherently through interviews on the matter. Contradicting each other, and one another. Stories of persons sponsoring the terrorist attacks would filter in. No information from the government on whether there were any investigations on any such persons, or if any investigations were ongoing at all. Oh wait! There was that news that the only suspect in the Nyanya bombing was released due to poor prosecution. I recall help being offered from other countries. There would however be one scandal or the other over the way the matter was being handled. Foreign aid began to be withdrawn. Then the government would throw their hands up in exasperation due to ‘insufficient facilities’. The present government has not fared much better. Despite the goodwill from all over the world, (even France), reports by the Army regarding their 'onslaught' against Boko Haram appears to be contradicted with the corresponding killings. This is not surprising, as their ‘intelligence’ methods leave much to be desired. For example, selecting poor looking cars and searching their booths with a cracked torchlight ... while praising the drivers of the beautiful looking cars, in the hope for some monetary gratification. It is indeed possible that the world is TIRED. Nigerians are TIRED. Of praying for Nigeria. 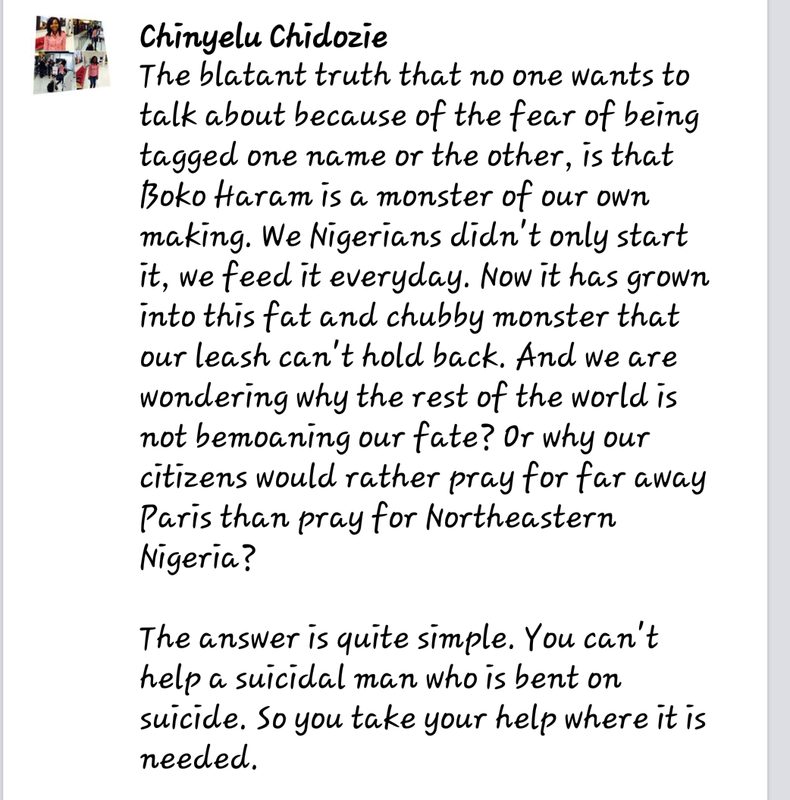 Of talking about Nigeria. Of carrying Nigeria’s problems on its head, even when the Government could not seem to care less. So for once, maybe the world needs to turn its attention to someone else who is more serious about the lives of her citizens. 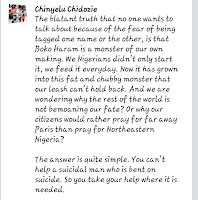 As noted by Chinyelu Chidozie, “you can't help a suicidal man who is bent on suicide. So you take your help where it is needed”. And remember… we all flock to London. To New York. To Paris. For Vacation. To seek greener pastures. To escape from political victimisation. So are these cities just good enough to host our proclivities, but should not be prayed for when they face torment?? Have we even considered that in our typical fashion of seeking green pastures elsewhere but home, there are thousands of Nigerians permanently living in France, which means at least, 1-5 Nigerian families will be affected? I do not think praying for Paris means not praying for Nigeria, or Kenya, or Syria ...or anywhere else that is home. I do not believe that because your house is always getting burnt down, you cannot take a moment to share an 'eiya' with a neighbour whose roof gets blown off. The neighbour whom you look up to for help to quench the continuous fires. The neighbour whose house you go to 'cool off' from the stress of work on vacation. That saying of "Charity begins at home" does not hold water in this case. Especially where ‘charity’ has already been taken away from home in most other respects. If we are so hung up on ‘Charity’, let us discard all our EPL and La Liga t-shirts; let us wear only the Jerseys of Enyimba FC and Kano Pillars. Let us throw away our Multi-choice Cable Decoders, and focus only on Nigeria Television Authority (NTA). Let us take our kids to Bodija and Kachingoro for vacations, and not Switzerland or Paris. Let us wear only made-in-Aba shoes, and stop patronizing the Italians. It is only after we have done these (and more) that we can truly point fingers at ‘unpatriotic’ citizens, and sanctimoniously preach about charity and home. Until then, I pray for peace all over the world. I pray the Nigerian government gets its act together to flush out the perpetrators of the incessant killings in the North. But in this very moment, I pray for God's comfort over the families in and the Nation of France. It’s a myth. A huge myth. So mythical, it's almost a scam. That all the magic answers to life's very many melodramatic troubles would grind to a perpetual halt, and the cheesecake existence you dreamt of would take off, once the this obstacle called "School" is over. School is in itself a bubble. It 'protects' you from the real hustle on the streets, and gives you something to keep you pre-occupied for the time being, while you ease into being a full-time adult. In the case of Grad school, the added qualification is believed to pave the way for quicker access to the career path laden with gold and honey. The path through which your first degree could not sufficiently navigate you to the promise-land. But school never adequately prepares one for the real shocker: REAL LIFE IS TOUGH. I remember hitting rock-bottom right after Grad school; despite 'doing all the right things', and bagging my second legal degree. I thought the world was at my feet. And then ... nothing but silence. No eager employers. No potpourri of job offers. No juicy appointments. Nothing. Zilch. Zero. Just silence. Survival meant re-inventing myself, and re-innovating my approach to the job market. Literally removing myself from ‘the box’ of dreamland, and plunging hard into the hustle. So I’ve penned some real life facts I learnt, which differ from the green-horned myths we leave school with. Yes! I made a good grade (First Class, Second Class Upper, Distinction). Now, all the juicy jobs will be kept for me, and employers fighting over me. Errr...there are at least a thousand other people with grades as good as yours, or better than yours. Besides, the 'juicy' jobs are rarely advertised. So that's where networking comes in. Before you've even left school, start applying for internships, volunteer opportunities, job fairs etc. Spread the word you're about to hit the labour market. Keep your ears to the ground...your eyes open. Now I've gone to Grad school, I have a Masters Degree/PhD. All those juicy jobs not offered to me before will be mine for the taking. Fact: Sorry to puncture the bubble. But the world is gradually moving away from certificates, and more towards experience. 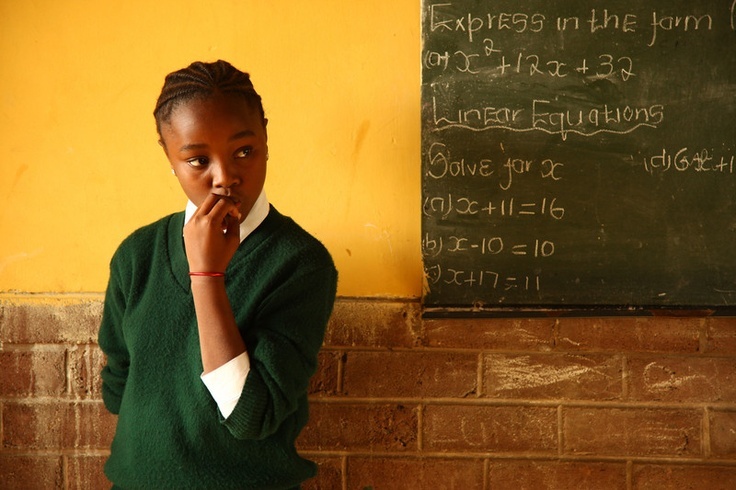 In some cases, the ‘excess’ Certificates could result into a disadvantage. You begin getting the perfect, polite smiles, which accompany the usual "I'm sorry, but you're quite overqualified for this job". I can only work ‘white collar’ jobs, or practice what I studied in school. Any other thing would be a waste of my education. ‘White-collared’ jobs in themselves evolved from professions which were purely technical at some point, and grew from practice-based learning to educational courses. Passion is what REALLY matters. i.e. whether you’re passionate (or not) about the job you’re doing. My education was so expensive. It's better I wait for the perfect paying job, than start something a job that does not pay well. After all, the patient dog eats the fattest bone. Get busy! Get your hands dirty, and do with excellence whatever work is before you. My intelligence and pure ability to meet deadlines is sufficient for me. I will quickly rise to the top with these. Everyone will just love me! I am a HUGE asset to any employer, and cannot be dispensed quickly. I wish I could leave you in this cocoon of utopia. But this myth is what it is: a Myth. In school, you could have been the Class Representative, Class Valedictorian, and the darling of all the Professors, based on your perfect scores. In the real world however (starting with your interviews), a lot more is required than your sheer ‘geekness’. Annoying as it may be, likeability is a huge part. You must be able to sell yourself to your employers, your colleagues and Clients. You must not necessarily be overly ‘chummy’ with all your colleagues (I'd even advise against it), or be so familiar with subordinates that you can't command their respect. But being the person everyone has a problem with is bound to throw you out as fast as (or faster than) your brains got you in. If you don't have them, you MUST develop people skills. Know how to navigate people, and master the art of emotional intelligence. Know what emotions to display at what time. Strike a balance between being booksmart/hardworking and being street smart. Also, you would have to go the extra mile, to accomplish your career goals. Working extra hours and taking additional responsibilities is not a 'gift' to your employers. It is a message you communicate that you are willing and able to be as invested in the Company as they are. So they can trust you with the Company. And you also train yourself for when you become the boss, in future. Now that you're aware of these facts, you can develop the right skills to equip you for your career path. And if you are already working, it's never too late to apply what you've learnt here. Feel free to pen down other facts and myths you identified along the labour rabbit-hole.